Do put hours of effort into creating beautiful advertising materials, and then wonder if anyone actually notices them? Do you feel as though your advertising efforts are falling on deaf ears? If you want to grow your piano studio, it is important to know when your advertising is going to be most effective. 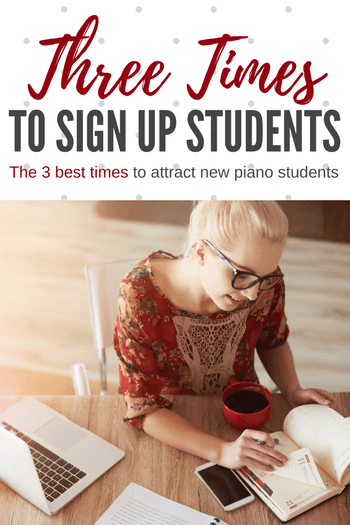 After many, many in the industry we have discovered, through trial and error, the 3 most effective times to advertise for piano students. Piano teachers advertise like mad in the weeks that lead up to the start of the school year. But more often than not, advertising efforts at this time of year fall on deaf ears. Families are either desperately trying to squeeze out every last drop of carefree summer fun or madly prepping for the start of school while your advertising efforts get tossed in the trash. Instead, start advertising your piano studio the week after school begins. By delaying your efforts by a mere two weeks, you are giving families a chance to prepare for, begin, and settle in to the school routine… thus giving your piano studio advertising efforts a chance to get noticed. Ahhh… one of our most successful advertising times of the year! During the last week of November we always begin our Christmas Gift Certificate advertising campaign. Desperate shoppers are always happy to “give the gift of music” to that impossible person on their Christmas list. Advertise an 8-week lesson package, hook your new sign-ups with your vibrant piano lessons, and you’ll have a jam-packed piano studio for the rest of the year! Join our Facebook group for access to free gift certificate designs! Every April we begin a “Spring Lesson Sampler”, allowing piano students to register for a 12 week trial session. Families jump at the opportunity to give piano lessons a try without a full year commitment. This time of year is an awesome opportunity to bolster your piano studio numbers before the summer break. Looking for ways to wow those new piano students at the very first lesson? WunderKeys Primer books are a fabulous way to make a great first impression. We get this kind of feedback every day about our method books! Find out more info here.